I’ve just finished a string of posts on the topic of critical reading (Writing A Critique: Reading Critically). While I was writing that series I got to thinking (again!) 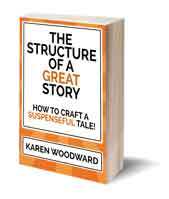 about the structure of genre stories. There are so many genres and sub-genres, the mind boggles at the thought of listing them all. But I wondered: What are the top-level genres? I don’t think there’s one canonical list of top-level genres. 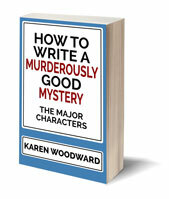 For example, some lists have thrillers as a sub-genre of crime while others hold that they are a genre all their own. It varies depending on the person who draws up the list as well as when it’s drawn up. Action, Comedy, Family, Horror, Romance, Sport, War, Adventure, Crime, Fantasy, Mystery, Science Fiction, Thriller, Western. All of these have sub-genre. For example, in the romance genre we find: Historical romance, contemporary romance, regency romance, time travel romance, romantic suspense, paranormal romance, spicy romance, and I’m sure there are many, many, more. Each genre and sub-genre will have it’s own particular structure, it’s own conventions. Ideally, any post on story structure would look in some detail at each genre noting the unique aspects of each. I’m not going to do that here. Though, at various times, I have discussed the genre requirements of mystery and horror, and I have puzzled over the essential difference between mysteries and thrillers. So, rather than look at how each of these genre differs from every other—I’ll leave that for you—I’ll examine what they each have in common. 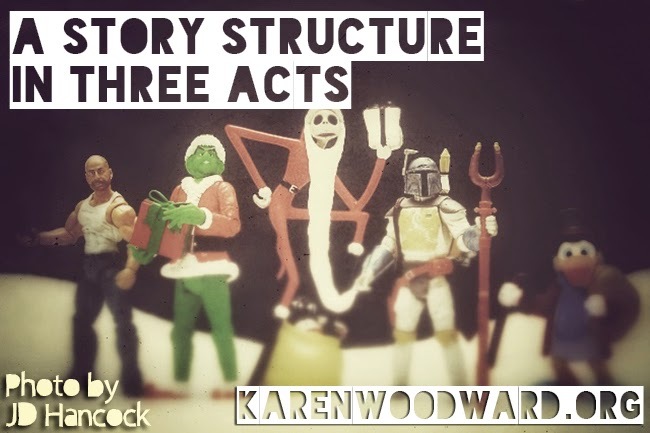 What I’m calling the Three Act Structure forms the structural skeleton of the overwhelming majority of genre stories. I think that the beginning of a story is the most complicated. It’s where we set everything up. It’s a bit like dominoes. You set them up in a certain way, in certain patterns, and then let them fall. Or like train tracks. You set the tracks up in a certain way, a certain configuration, and then release the train. Or, to completely change metaphors, if we plant an acorn an oak will grow. Not a willow or a birch. An oak. That’s like a story. In the beginning we introduce the protagonist and show you her strengths and weaknesses, her deepest desires as well as her scars. Then we put her through the fires of adversity. By no means are her actions predetermined, but we are giving the story a definite direction. We’re giving the reader certain expectations. And that all happens in the first few pages! We’re often admonished to introduce the protagonist at the earliest possible moment—on the first page if not the first line. And it’s excellent advice. After all, the protagonist is who we want our readers to bond with, to care about and identify with. Further, how we introduce the protagonist is important. We should, we’re told, introduce her in action (see: Jim Butcher’s Livejournal). This puzzled me at first. Why? I wondered. What’s so great about action? But action, generally, implies a goal. A temporary one, sure, but a goal nonetheless. A baker, red in the face, is running out the door of his shop. Why? Well, he’s running after a shoplifter, or the shipment he’s just received is for the wrong thing, and he wants to grab the delivery people before they drive off. Or ... well, you get the idea. Action implies a goal, it makes the reader ask: why. And that’s a powerful hook. Further, we can see (show vs tell) that the goal is important to the protagonist in that moment. But we’re not done. The action should also tell the reader something important, something significant,∂ about the protagonist. I won’t ramble on about tags and traits in this post (I’ve written about them here and here) but the action the protagonist takes at the beginning of the story should tell us something significant about them, about the character’s essence. And all right at the beginning of the story! Once all that is established I think stories are much easier to write, so I think the extra effort at the beginning is worth it—not to mention that it will increase the chances a reader will want to keep reading. In the remainder of Act One we introduce all the significant characters. Anyone, that is, whose goals are important to the protagonist achieving her goal. The protagonist doesn’t always accept the Call to Adventure. Often she rejects the Call and must be talked into it, often by a mentor. If a mentor is involved they may give the protagonist something that will aid her on her journey. For example, in Star Wars IV, Obi-Wan Kenobi gives Luke his father’s lightsaber. Next time I’ll talk about Act Two. Thanks for reading!